In the late 80s and early 90s, it seemed like every comedian was given a sitcom. Most were simply 'based on the comedy' of the headliner, putting the (often) titular star in a situation that would provide the best forum for their act. Whether it was Roseanne or Home Improvement, The Cosby Show or Everybody Loves Raymond, the comedian was never a comedian on the series. Except, of course, on Seinfeld, probably the most successful and influential of them all. Since the 'show about nothing,' several stand-ups have followed suit with series that followed (a version of) their lives in comedy, Curb and Louie come to mind, but the format has strayed far from the mutli-camera, laugh track days of Seinfeld. Until now. Twenty-five years after it debuted, Fox is trying to make history repeat itself with an obvious homage to the ground-breaking NBC sitcom. So, what's the deal with Mulaney? Sadly, the great material at the heart of the throwback comedy (like John Mulaney's New In Town) can't save it from feeling out of time. And we all know how important timing is for comedy. Part of Fox's new 'Sunday Funday' line-up, Mulaney follows, as you may have guessed, an up-and-coming New York stand-up named John Mulaney. His roommates include an uptight personal trainer named Jane, played by fellow ex-SNLer Nasim Pedrad, and Seaton Smith as Motif, another struggling but working comic. Another veteran of Saturday Night Live, Martin Short stars as Mulaney's new boss, a self-absorbed comic legend turned game show host named Lou Cannon. Rounding out the cast are Zack Pearlman, who plays trust-fund baby/drug dealer/punching bag Andre, and Academy Award nominee Elliott Gould, who is signed on as the gay stoner neighbor, Oscar. The main problem for any throwback is to avoid feeling dated and Mulaney suffers by not adding a new spin on the old formula. It is Seinfeld all the way down to the stand-up sequences and jaunty noise between transitions. I originally challenged myself to not mention the NBC cultural juggernaut during this review, but that's nearly impossible. 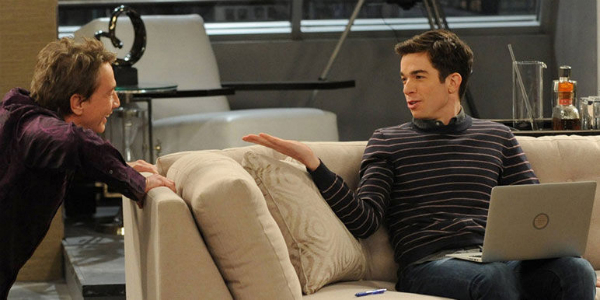 Even the sitcom itself calls Mulaney (the character) a 'Seinfeld ripoff' in the much-improved second episode, titled "Sweet Jane," that dramatizes his bit about the impossibility of forcing girls to be friends. Yes, the good news is that the Fox series does get better with each installment. The bad news is that the pilot is terrible so getting worse was pretty much an impossibility. None of this is fun for me to admit because I'm actually a big fan of John Mulaney's work, the stuff he wrote for SNL (including Stefon with Bill Hader and his two Update appearances), his stand-up or his bits with Nick Kroll on Kroll Show (and Comedy Bang! Bang!). He's very funny. I don't know why his show is not. The pilot got almost no laughs out of me and that's not good for a comedy. Perhaps having seen some of the material before caused some would-be-laughs to become (at best) smiles? Sure. I'm willing to admit that maybe Mulaney doesn't feel fresh to me because I've already heard the jokes and not because of the well-worn format. But I don't think that's the case. I like the cast, and they're all in fine form here (especially Pedrad and Smith as the roommates, not so much Short as the fading star) and the sitcom does slightly improve with every episode (I've seen four), just not enough to recommend when there's so much else to watch on Sunday nights and so little space on the DVR. Mulaney airs Sundays at 9:30 p.m. ET (this fall) on FOX. Created by stand-up comedian John Mulaney, the series stars Mulaney, Martin Short, Nasim Pedrad, Seaton Smith, Zack Pearlman and Elliott Gould.